Independent Transport Videos are proud to present this archive video presentation of the iconic AEC Routemaster bus running in service in Greater Manchester. The video was shot by transport photographer Malcolm King in the late 1980’s and features Routemasters running on the Wilmslow Road and Palatine Road corridors. Malcolm now takes up the story…. 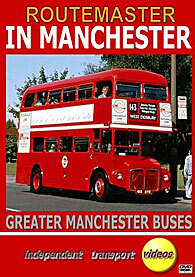 “Turning back the clock to 1963 Manchester Corporation hired from London Transport RM1414 (414 CLT) for trials on the 41, 42 & 43 routes. After these trials no orders were forthcoming. In 1982 RM1414 was withdrawn from service in London and the vehicle was later donated to the Greater Manchester Transport Museum in January 1983. RM1414 is still to be seen out on museum duties at most open days usually to be found on the shuttle service to and from Manchester city centre. Twenty-five years later in 1988 ten Routemasters were purchased from London Buses. They were numbered 2200 – 2209, being CUV 200C, 136 CLT, 776 DYE, 604 DYE, CUV 162C, 618 DYE, WLT 378, WLT 429, WLT 698 & 807 DYE. The route was branded the “Piccadilly Line” with this branding replacing advertising between decks. Under the lower saloon windows there was a stylised version of the London Transport logo. This took the shape of a horizontal line superimposed by a new version of the GM Buses logo. The livery used was like the London Transport red with the white relief band, the London fleet numbers being used as well as the GM numbers being displayed on the white band above the engine canopy and above the rear lower saloon platform window. See it all for yourself as you are taken on a journey between Piccadilly and West Didsbury on the 143 route. We start our video by looking at RM1604 being prepared for service with G M Buses. We then move to West Didsbury on launch day, the 5th September 1988 with a special service being laid on for the dignitaries with RM2200 (CUV 200C) performing this duty. The ‘PRIDE OF PRINCESS ROAD GARAGE’ took to the streets of Manchester but is later seen with flat batteries with as many as 4 RMs in the turning circle at West Didsbury. The service passes the University halls to where thousands of students rely on the buses on the Wilmslow Road corridor. Students being what they are, try to save every penny they can so tended to use the RMs on the 143 service with these buses also giving them easy access to the bus at traffic lights etc. Competition came from other operators like Finglands and Walls, as well as the many other services operated by GM Buses though all these buses had the standard forward entrance layout. The 16th June 1990 was to be the last day of service for the “Pride of Princess Road” buses and we see the service operating through the evening peak until it was time to bid farewell to the RMs on the 143. The ‘Farewell’ was to finally come on Sunday 17th June 1990 when RM429 (2207) & RM1776 (2202) performed a tour of the 143 and visited other places the buses had not previously strayed to. This included Stockport, the 192 route to Hazel Grove and the 363 to Mellor Road End where we see RM429 take on four watering cans of water before visiting the premises of Pennine Blue. The tour continues to Victoria Station with church bells chiming where the blinds are set for route 256 Flixton, Red Lion (Thanks should go to Russell Upcraft for providing the blinds for the farewell tour). The tour ends at Piccadilly. It is worth noting that RM1776 was advertising “Summer Holiday” - nothing to do with Cliff Richard - it was for a local TV station programme”. ....... So take your seat and enjoy this nostalgic video presentation featuring the iconic Routemaster running in service many miles away from its natural home in London!